Being Frugal and Making It Work: Silverwood Theme Park - Family 4 Pack Ticket Giveaway! Silverwood Theme Park - Family 4 Pack Ticket Giveaway! We get season passes to Silverwood Theme Park every year, have for the past 10 years. We live just about 15 minutes away, so it makes it the perfect summertime activity for our family. We go for a few hours and then come home. The carousel is just inside the main gate at the entrance of the park. From the time our kids were little (1 1/2 years old), they knew that this ride was our very last stop in the park before heading home. It made it easy to leave the park this way - no fits! 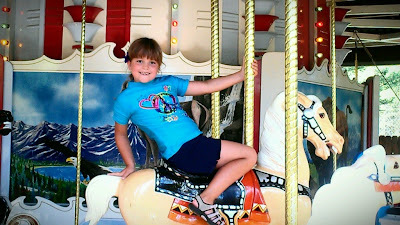 Now at ages 12 and 9, we still ride the carousel once or twice before heading home - it's a tradition! 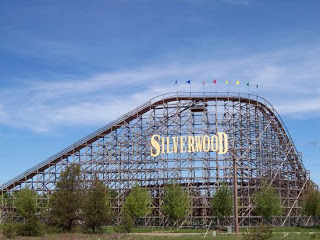 Located in beautiful North Idaho, Silverwood Theme Park has over 65 rides, slides, shows and attractions, including four roller coasters, Boulder Beach Water Park, a steam engine train, live entertainment, restaurants, and more... One admission - both parks! Of course we love the rides and water slides, but we also love the variety of other fun activities like the magic show, train robbery on the steam engine ride, bison, and the adorable mascots; Garfield and Odie! For those older children and adults you can ride to your hearts desire. Coaster Alley may be exactly what the thrill seeker has been looking for, including Timer Terror, Aftershock, Tremors, Panic Plunge, Corkscrew and the newest addition, Spin Cycle! Other rides include the log flume, bumper cars, bumper boats, tilt-a-whirl, antique cars, thunder canyon and an all-time favorite, the ferris wheel! Don't forget about the variety of arcade games, food vendors, retail shops, and our personal favorite... the ice cream shop! If you order a waffle cone here you may get a little more of a sweet treat than you realize... this is what a single scoop waffle cone looks like at Silverwood!! The water park is the perfect place to cool down on any hot summer day. We always start off by going down the big family tube water slides, then we hit the wave pool, then it's off to the wave pools and Polliwog kids park where there are slides, waterfalls, water squirters! 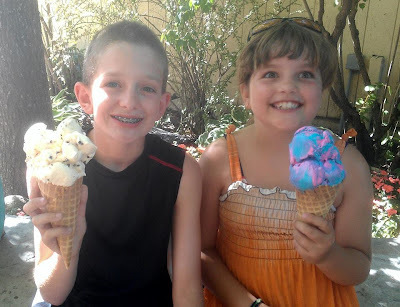 Looking back at all of the times we have gone to Silverwood Theme Park and all of the photos I have taken while we were there... we have had a lot of great times and made great family memories there! 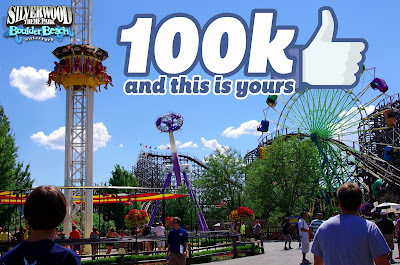 Silverwood Theme Park is looking to reach their goal of 100,000 Facebook fans before September 1st. Be sure to "LIKE" Silverwood's Facebook page so they can reach their goal and throw a HUGE Facebook party!! If they reach their goal, all of their Facebook fans are going to be able to get in for ONLY $10 and they will get into the park 1 HOUR EARLY to ride roller coasters before the public! Plus TONS of giveaways and random drawings!! This giveaway will end August 21st at Midnight EST. Disclaimer: I only recommend products or services I use personally and/or believe will be a good fit for my readers. The views and opinions expressed on this blog are purely my own. Results may vary. No compensation was received. our kids love silverwood!!! we love tremors!! 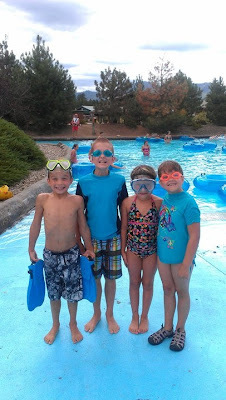 Boulder beach is our favorite when we go to Silverwood. I love watching my grandson's smile while they are on the toddler rides :) Its the best. If I win I plan to give the tickets to my son's and their wifes so they can have a fun time together while i watch the pumpkins at home. I would love to win because I have a family of 4 and it is expensive to enjoy a day at silver wood. With free tickets our family could enjoy getting in for free and be able to have lunch and play games without having to pay at the gate for the entry. I don't know which one is my favorite but Aftershock is pretty awesome! And my son loves Tremors!! We love, love, love Thunder Canyon. We have all tried the Panic Plunge once. It's so scary, but definitely something everyone should try! We love Thunder Canyon because, not only is it such a fun ride, but after wandering around in the heat the cool down is such a treat! I love Tremors. I am a roller coaster fanatic! I love the waterpark the most...you can spend all day there and never get bored! The big slides are great, but my real favorite is the lazy river! I want to win because with our big family, we don't get to go often because of the cost. This would make for a great family day! Boulder Beach is by far my favorite! Also love Timber Terror...pure nostalgia for me. I'm bringing two friends of mine to Silverwood to introduce them to its wonderfulness before I leave the country for two years. It's a must before I take off. I love roller coasters! Can't wait to go to silverwood next weekend! My baby's first time! My absolute favorite ride is Aftershock, roller coasters rule!!! Have only been on Tremors coaster... hoping to be brave enough to tackle the rest on our next visit! love Silverwood! been going 20 years! We love the wave pools at boulder beach. We will be heading back for my daughters 16th bday party. Perfect place to celebrate! Thunder canyon is the ride I want to ride the most! KAtie Balbin- We always enjoy going on the train ride at the end of the day. It is a nice way to relax and unwind and the robber show is always fun. We love the wave pools at boulder beach, we will heading back for my daughters 16th bday party. Perfect place to celebrate! We love the roller coasters and boulder beach. I would love to win because my kids and I have never been to Silverwood and it is close enough for us to make the drive! Aftershock is my favorite ride in the park followed by Panic Plunge. We usually spend the afternoon in Boulder Beach floating the Lazy River several loops. I would love to win four tickets to Silverwood as we are a family of four and have wanted to go! would love to win this! haven't been able to take the kids for a couple of years now. My husband is deploying and we want to go tho Silverwood as a family trip before he leaves. Can wait to ride the coasters and water slides. My little brother and sister have never been to Silverwood before due to lack of funds to go. They've lived here their whole lives and always beg to go to Silverwood. It would definitely make their whole summer amazing if we were chosen. I love the Tilt A Whirl, even though I know it's not a high thrill ride. It's so much fun watching my older kids get silly trying to make the car spin faster. we go every year. it's great for all of my kids ages 2, 8- and 15. We love the river ride because we can all just be lazy and hang out! Would love to take the kids to their first silverwood trip. I would love to win because we haven't been to Silverwood this year and it would be a great way to end the summer. I would love to bring my grandkids to Silverwood in the next month or two! I don't care what they say, I still love the corkscrew! I just went yesterday.My favorite ride was the Aftershock. It scares me the most, I don't really want to stand by it in line but after it's done it was worth it every time. I would say that aftershock would be my favorite ride...to watch..haha. My daughter would love to ride that ride! Hope we win! I'd love to win tickets. While I went only a day ago, My once yearly trip was taken on a saturday. we only made it on six ride total. I'd love to take my boyfriend and the kids this time. Silverwood is awesome. Tremors is the best hands down! I took my kids and grandkids to Silverwood. We had a BLAST! Our favorite ride was Tremors. Whoot! I love Silverwood, I've gone there 3 times before and we're going again! I've always loved Tremors the most. That drop is always so exciting! Boulder Beach looks awesome, would probably be my Toddler's FAVORITE!! 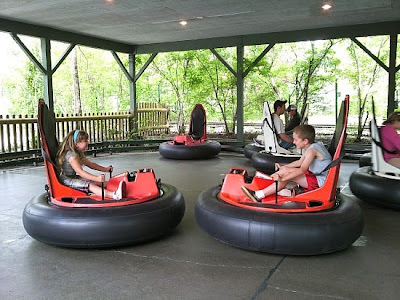 My favorite ride is thunder canyon taking the whole family would be fun since my kids where babies last time we went. We are going to Silverwood in September for the first time. The entire family is so excited! I used to live in Sandpoint, and purchased a gold pass one year so my kids and I could go to Silverwood whenever we wanted. I miss the fun days we had there, plus I loved the pass because I could bring friends as well! My favorite ride is aftershock i can ride it all day. It's the first coaster i ride before anything else. I want to win so I can take my son who has never been there and make new memories... and make it a yearly event. 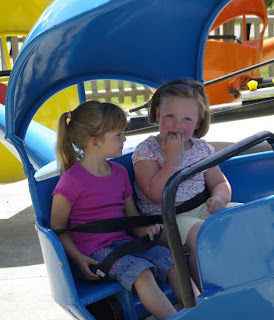 We love silverwood and would love to get passes liked the people on this blog. Living so close it would be great to take the kids for a couple hours on a boring day. We love Silverwood!! We only get to go a couple times a summer! Ip we are hoping next year to get season passes! My girls have so much fun! I want to win because it would make for a great family trip for my girls and I...a new adventure! Avalanche Mountain is an absolute blast with twists and turns this is a favorite of mine. I love Tremors and Panic Plunge! Just relocated to Michigan from Oregon, would love to make this a memory and tradition for my kids! I have heard lots of great things about the park and surrounding area. What a great way to end the summer!! Just moved up here and would love to take my 3 little boys! I would love to win because it would be a great excuse to pack up & take a roadtrip. What fun would it be to end up at Silverwood. My favorite is in the water park, the kids part, my 2 year old loves to go down the water slides. We would love to win the tickets. Love Silverwood but haven't been there for a couple years. I like Thunder Canyon. We love Silverwood we try to take the whole family to it each year. The grandkids love to play in the wave pool. Corkscrew is always a great ride to take the grandson on even at the age of 7 he hangs out with the adults. It would be a great surprise to treat him to tickets to Silverwood since he is moving away. Our tradition was always to ride the carousal first and last too! My girls love to go on the tilt-a-whirl!! There dad is so gracious and goes with them! I would get sick! :). 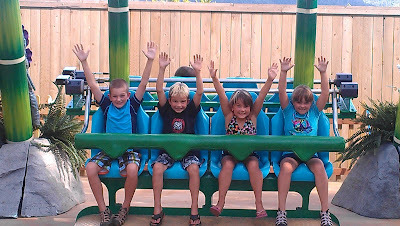 We love the water park, roller coasters, amusement park games, and other shows. We love it all! the tilt a whirl is my favorite ride! My kids win tickets for reading every year but we have never gone. Would love to take them! I want to win these tickets because i know my family would love to go. Especially my little brother he loves the water park. We stay there all day til it closes then we go to the amusement park. My oldest daughter has been to Silverwood twice; however, my youngest and I have yet to go so I can't say I have a favorite ride; they all look like fun to me!! I love silverwood! I would love to take my family there! Good luck to everyone! I love the lazy river in boulder beach, and I'm hoping to get my 5 year old on some kid rides finally this year.. He's been too scared, but this might be his year. Thunder Canyon would have to be #1!!! I have only been to the park a couple times but, have loved it each time... I would love to win tickets to take my boyfriend who has only been once and my little sister... We have never been to the boulder beach part and it would be a fun experience for all of us! In the future when my son is older I plan on taking him to enjoy silverwood as well! My family and I spent the entire day at Silverwood August 2nd (when it was raining all day). Even though it rained, ALL day, (and we missed out on Aftershock) we had an incredible time. We would LOVE to come back again and spend another day there. My favorite silverwood attraction is the wave pool. theres just something about being in that fo tropic setting i just love. its the reason i go there. I have lived in Port Angeles, WA for the last 31 years or so (since the 3rd grade). I have only been to Idaho once when I was kid. I haven't been back since. My youngest daughter (9th grader) has begged me every summer to take her to Wild Waves because there's a really cool roller coaster there. All her friends have been to Silverwood and have recently convinced her it's the best. Since I can barely afford Wild Waves, I'm not sure we'd ever go as far as Silverwood. I just got done graduating and am looking for a job at the moment. Hopefully I will get a chance to take her before she graduates and leaves home. Any of the Slides at Boulder Beach! I hope I win... my son is 7 and wants to go! Would love to check out the new spin cycle! Tremors and Timber Terror are always favorites, as well! Also, the reason I would like to win is because I would take my fiance and another couple with us since neither my fiance nor I have been in over two years and he leaves to basic training soon. Just something fun to do with the rest of our summer. You know it's a good day at Silverwood, when your friend comes off the ride Aftershock barely able to walk straight! LOL It didn't convince my dad to go but it was hilarious!! We love Boulder Beach at Silverwood! But our favorite ride would have to be Thunder Canyon! I would love to win because SilverWood was the very first theme park i went to and the first roller coaster experience was at silverwood. 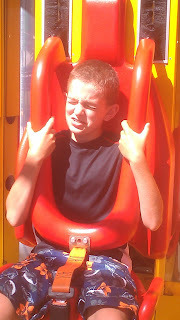 I would love for my son to have his first theme park experience at silverwood.. I love the atmosphere and everything about this park!!!!! My husband and I love to ride the Train after a long day at the park! Best way to end the day. We are really excited to be bringing out children to the park soon!!! I need to win Tickets because last time we went the weather turned out bad and we didn't make it to Boulder Beach, my son was very sad about it :( Help me turn that frown upside down. Water park always seems to trump all else. I would like to win so I can have a fun vacation before it's back to another stressful year of school! ok so my FAV is TREMORS LOVE IT SCARES ME but its so much fun can't wait we're taking our kids this up coming weekend Hoping to win tickets so we can take our kids again before school starts!! My family's went the last two years but couldn't afford it this summer! Can't wait to get over there again. So much fun for the whole family. Love the corkscrew! I would have to say my favorite is Tremors as well as my oldest but my younger two love the Tilt-a-Whirl. We would love to win a trip this year. I try to take the kids every year I can, but this year to many car issues I can not swing it this year. I would love to win these four tickets because we just purchased a house that needs a new roof so there is no extra money for four tickets to Silverwood. Thank you for the opportunity. Its hard to choose a favorite whats there not love about silverwood! My husband and I love the adult crazy rides! My 4 yr old son loves the kiddy rides! And I love that he loves it. And my 1 yr old os still very tiny so she loves all the grub refreshments the sweets etc.! And last but not least we love the waterpark bc thats where we can interact together. Every now and than my husband or myself will stay with the kiddos while we the other goes on the slide and than do the switch off. U get a taste of silverwood regardless the age you are! My family loves the water park, but the older kids like the roller coasters and ice cream. I Love going to Silverwood! My son has fun too with the rides he can do for now. I have to say Scarywood is blast too! The AfterShock would be so amazing! I've never been on a hanging coaster! My daughters and I love thrill rides. My husband would rather stick to the kiddie rides!!! We've tried to come to Silverwood before but it never worked out. We would love to win! We just love the magic show. The kids are mesmerized! My two kids love riding all the rides but their favorite is tremors. As far as my husband & i our favorite is the aftershock. We all love Silverwood!! Keeping our fingers crossed!! My daughter and I could spend all day in the water park, but my son would never forgive us because his favorites are all roller coasters. Would love to win tickets! Since becoming a stay at home mom over a year ago we dont have a lot of money for "family fun time"
I Used To Go To SilverWood Every Year For My Birthday, From 5 To 20, I'd Love To Start The Same Tradition With My Kids. I Always Loved The Octopus, But That's Been Gone For A While Now. Best Ride With My Kids Is The Tilt-A-Whirl. After living in Spokane for 12 years, we went to Silverwood for the first time yesterday! I have four children so it's not easy to make it a thrifty affair, but we had a great time!! I really liked Aftershock, but I think the big green water slide was my favorite! Such a fun day!! Silverwood fan here! I've been going since I was a kid and now I take my kids at least once a year and with our extended family. We live over 3 hours away and its always worth the drive. I would love the opportunity to take my family back to Silverwood! They want to go ride the log ride again! I would love to win these tickets because i love all the rides and the water Park and my family can't really afford to buy tickets to go to Silver Wood. I've been wanting to come back it's a fun place to be at during the summer. The reason why I would love to win this is bc we want to take another trip this yr but to celebrate my husbands graduation he is working full time 12 hrs at the nuclear plant and is going to school full time this would be a great way to celebrate! Being able to scream at the top fo your lungs of excitemnt of your accomplished goal and the craziness on the rides we would be riding! Oh I would love to win these tickets! My step son is coming up to visit from a small town in Montana and has only ever seen the park driving by!! I would love to take him and give him an awesome time and opportunity to do something fun that he has no way to ever get to do where he lives!! I would like to win because it is a great family fun place ! And the kids love it! We loved the family water slide this year, my 5 year old was finally big enough to go too! We would love to go back to Silverwood, we can afford one trip a summer, but if we won it would be fun to do all the things we missed out on! I love the Ricochet Rapids because it looks fun and I love to go on tubes and water slides and I haven't tried this one yet. Boulder Beach with the kiddos = Amazing memories in the making. Nothing says summer like a family day at Silverwood! Me and my kids have had a rough last 9 months. Their dad walked out on all of us and we haven't seen him since. This summer has been tough as money has been very tight so to win would just make a PERFECT ending to our summer that we got to go do something so fun at such an amazing place. I remember when the carousel wasn't there - you used to be able to ride real ponies in that spot! Also, the skating rink was an awesome airplane museum. I really miss the airshow and tiger, as well. Sitting in the High Noon Saloon, drinking a Shirley Temple, watching Snoopy and the Red Baron go at it was tops! I live in New Mexico, so I probably won't be able to visit Silverwood if I won.. but my family is in Montana and I'm sure they could make good use of the tickets! Haven't been to Silverwood this year but I would love to go! We went a few years ago and loved the afterschock and tremors and the water slides not to mention the wave pool!! I just with the tickets were for two days, there's just too much to do in one day. My family loves the aftershock! I want too win because the kids and I love silverwood. The roller coasters rock! And we have not got to try out boulder beach yet! We also love the train ride! Our kids would LOVE this!!! I want to win this give-away because our money situation is tight and we would love to go and have some fun to take our minds off of our situation we are in. Me and my 5 kids would be so grateful of having fun time to ourselves. Corkscrew has always been my favorite ride :D Haven't had the chance to go in years, hopefully we'll get to again soon! Great place....have recommend to friends! My family's favorite thing to do at Silverwood is, get ice cream and go on the train ride... usually the very last thing we do!! Panic plunge is my favorite ride there!! We love the magic show! We also love the giant ice cream cones! But, the carousel is great...so is the train ride! We haven't been in years! Would love to go again! , normally during our wedding anniversary, so we can be with our family and celebrate together. It wasn't in the cards for us this year unfortunately. So we are crossing our fingers that we are fortunate enough to be able to win a family vacation, however if it's not us it will be another very lucky fortunate family. Thank you Silverwood for offering the opportunity, and thank you Being frugal for offering your blog as a host! We want to win because we haven't had a vacation yet this year! I went for the first time this summer, and had a great time! I really liked the Tremors coaster! A lot more of a thrill ride than expected! Thanks for a chance at this great giveaway! I would love to win a trip for my family!!!! Love silverwood and the after shock! Silverwood is awesome. I love family owned parks, they are always better. Spin cycle was my favorite. :) Thanks for the chance. My favorite ride is Tremors, I've been going on it since it opened. I also love Aftershock. I love Silverwood! My Favorite ride is the Panic Plunge! It gives me the best tummy tickle ever! I want to win the 4 pak because my family loves going there, but we only go maybe once a season cause it's just too expensive for our family. And everytime we do go, we just never seem to have enough time to do everything so we always miss out on something. Our favorite attraction at Silverwood is Boulder Beach! We love to hold eachother in the "Wave Pools" and laugh the day away! As for us big kids, it truly is about seeing our children smile and sharing priceless memories with them! WE LOVE SILVERWOOD!! I love the roller coaster! My favorite ride is corkscrew. its awesomeeeeeeeeeee and i hope i winnnn!!!!!!!!! I love going to Silverwood with my kiddos. Our favorite ride is the Aftershock! The lazy river is mom's favorite attraction in Boulder Beach. My family has enjoyed Silverwood 3 times and every time it is mentioned in the house the kids ask "When can we go again?" We are planning to go at the end of Aug. and can't wait to ride the new spin cycle . This is the first time we have been able to all ride on most rides. My favorite has always been tremors but the new ride aftershock is amazing! Our Family usually goes to Silverwood every year for the girls birthdays (2 of them have birthdays in July) but this year we haven't had the resources to do it. Been enjoying Silverwood since I was a kid. Tomorrow I'll be going with my mom, dad, my kids, my brother, his lady, and their kid. Great place for family fun at all ages! How Do You Create the Perfect Web Design? Natural Disaster Survival Kit - Are You Prepared? Enter to Win Blog Giveaways - I Won 3 This Week! My Weight Loss Journey - One Year Later!